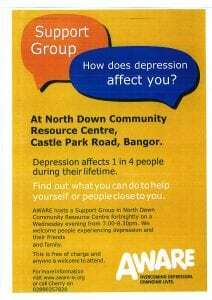 Fortnightly Support Groups at NDCN’s Resource Centre, Castle Park Road, Bangor – next on Wednesday 1st March at 6.30pm to 8.30pm. Depression affects 1 in 4 people during their lifetime! It’s FREE to attend and offers support to people with depression. Groups give people the opportunity to meet others with depression and learn more about the illness. Family and friends are also welcome. For more info, please go to aware-ni.org or phone Cherry on 028 9035 7820. AWARE: Overcoming Depression. Changing Lives.